Love this faucet! Well made and truly is SPOT FREE! 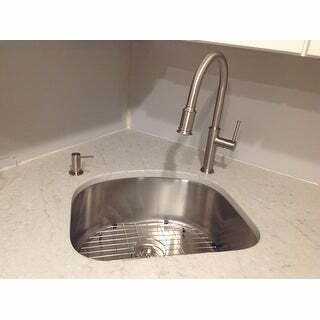 Optional Deck Plate Included: Allows you to install this single handle faucet on a 1, 2, or 3-hole sink. Dimensions 11.5 In. X 4.6 In. X 17.7 In. I am so excited. 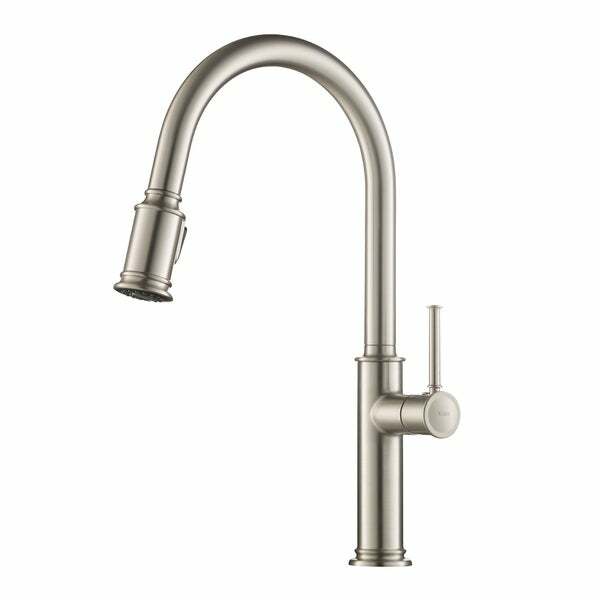 I just received the KRAUS Sellette Single Handle Pull Down Kitchen Faucet with Dual Function Sprayhead that will be installed in my new kitchen sink as part of a kitchen renovation. The faucet looks substantial and the stainless steel is an attractive finish. Good quality.east to install. Looks and works great. We purchased this faucet for our full kitchen remodel. We have been using it a few weeks now and are very happy. The handle is easy to pull when your hands are full. The finish is so nice and a snap to clean up. The pull down feature is easy to use and pulls down and retracts smoothly. Our old faucet had the same function but you had to fight with it to pull it down. The style is simple, elegant and timeless with a twist of modern. We wanted something on the larger side since the window at our kitchen sink is huge. We didn't want the industrial look so this was a good in between. It came very well packaged and the plumber had virtually zero issues with the install. I love the faucet. It looks traditional yet nice in my new kitchen. It's easy to use, I get great water pressure and water comes out nice and hot when needed. My only con might be that the sprout comes out about midway in sink, a little farther than I was used to with my previous faucet. It's not a big deal for me, I love it for the price, look, and function. I am so obsessed with this faucet. Its the perfect height for a nice deep farmhouse sink, we went with the oil rubbed bronze color and I now want to replace all my fixtures to match. It was easy to install, feels very well made and the compliments are endless. This brand is the best and this faucet by far adds such a nice appeal to our kitchen remodel. Love this faucet! It is beautiful, functional, and well made. Easy to install and I know it will last forever sincerely it is all stainless steel. Love Kraus! We purchased another kitchen faucet a little over a year ago and it had a design flaw that warranted us purchasing another. After careful consideration and reading the reviews, we decided on this faucet. We could not be more pleased! It is sturdy, stylish, and functional. Super happy and would definitely buy again! We are very impressed with the functionality and style of this faucet. It has a great reach. The reason I am rating it four out of five stars is because the pulldown nozzle is made of plastic and not chrome plated brass. Otherwise, it is would be a five. Love it. Looks great and is very functional. Does not show water spots. Was looking for a faucet to match my Kraus sink for our kitchen remodel. This one matches perfectly. Looks great and works wonderfully. Highly recommend Kraus products. Very nice, but the handle came off. Fortunately I had a plumber still working on my remodel and he was able to put it back on. But I’m worried it will come off again. I’ve bought others I like better. It’s nice but I don’t think I would buy it again. Beautiful, sleek faucet. Instruction were very accurate, Product was well packaged. Great buy. Love this faucet! Looks and works great! Very well constructed, sturdy materials and the finish is great. Like the tall faucet and integrated spray. This faucet is perfect for my kitchen. It was very easy to install and we had no issues with the parts and setting it up. "Is the spray self retracting?" It has a modern look for a boring style of faucet. "Is it lead free? Other kraus pull downs on your site have Cal warning about lead. Pls ensure lead free!!" All Kraus faucets are lead free. All Kraus faucets follow the below compliance and other regulations as well: AB1953. California, Vermont and Maryland Compliance. California AB 1953 (or Vermont S152 for a Vermont query) limits the allowable amount of lead content in pipes, fittings, and plumbing fixtures used to convey drinking to a maximum of .25% on wetted services. This is less than in most states whose standards are based on the Federal Safe Drinking Water Act, an effective standard for making drinking water safe. AB1953 went into effect on January 1, 2010. Affected products include kitchen faucets and bathroom faucets. "What is the dimension between the faucet and the sprayer. I need to make sure it reaches into the sink." The spout reach on this model is 9 1/2". I hope it helps. "Does this have a plastic handle?" "How far out does the hose pull down?"